Thetford Marine recently announced its new line of powerful and Design for the Environment (DfE) –recognized cleaning products. Safer for humans and the environment, Thetford’s Marine Care line meets the Environmental Protection Agency (EPA) DfE program’s rigorous criteria without sacrificing performance. 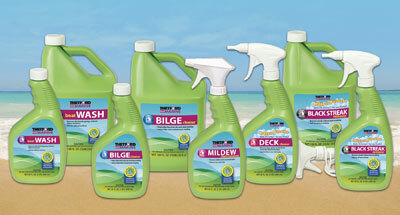 DfE-qualified products include Thetford’s Bilge Cleaner, UltraFoam™ Black Streak Remover, UltraFoam™ Deck Cleaner, Mildew Stain Remover and Boat Wash, packaged in bright green, 100% recyclable bottles made with 25% consumer-recycled plastic. All five products are formulated with ingredients that have more positive health and environmental characteristics than conventional cleaners, including a moderate pH.